Captain. Co. B, [116th] U. S. C. T.
Born in Piermont. N. H., April 11, 1844. In the latter part of March, 1865, the Second Division of the Twenty-fifth Army Corps, General William Birney commanding, was detached from the Army of the James and moved to the left of the Sixth Army Corps, near Hatcher’s Run, Va., to take part in the final operations against Petersburg. On the day before the capture of the outer lines of fortifications, General Birney was instructed to have his division in readiness for an assault on the enemy’s works in front. His division lay behind a low ridge, which sheltered it from the view of the enemy. Beyond this ridge and well out toward the enemy’s works, in an open field, were rifle pits in which our pickets were posted. As these rifle pits were located in open ground and within short range of the enemy’s fire, the pickets could be relieved only after dark. Upon receipt of the orders stated, General Birney repeated them to the members of his staff, adding that he desired one of them to go out to the rifle pits at the front and learn all he could as to the character and extent of the enemy’s defenses, so that he might know what obstructions his troops would encounter in making the proposed attack. He stated that this mission was so perilous in its character that he did not wish to order any officer of his staff to perform it, and so asked someone to volunteer for it. A significant silence followed these remarks. 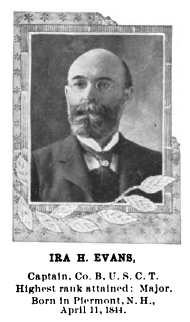 Captain Ira H. Evans of Company B, [116th] U. S. Colored Troops, was acting assistant adjutant-general of the division, thus holding the most important position on the staff, although he was the youngest officer on it, at that time lacking a few days of being twenty-one years of age. He felt that he must perform this duty and signified his willingness to do so to the general. He dismounted, and giving his horse to an orderly went up to the top of the ridge, then ran to the line of the rifle pits as rapidly as possible. His course was through an open field, gently sloping toward the rebel works, so that he was in full view of the enemy, who at once opened a sharp musketry fire on him. He reached his goal amid a shower of bullets, and dropped in among the surprised occupants of the rifle pit without much formality. Having obtained the information he desired, he made his run back as speedily as possible, amid another shower of bullets. He was the only man in the Union lines visible to the Confederates at the time, and they gave him their undivided attention.